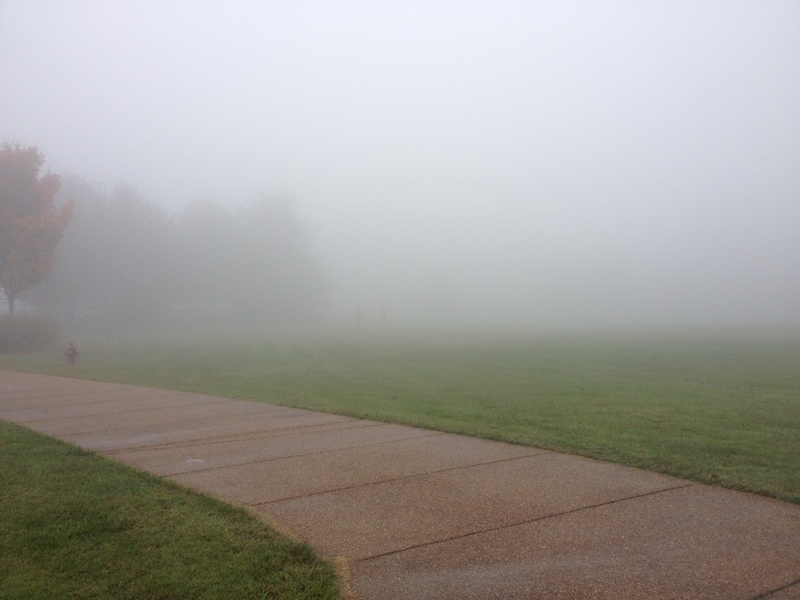 When folks told me that Sewanee had fog, I really did not think anything unusual about it. Seriously, though, I had never experienced the fog that I had only seen in movies, the kind like Scarlett O’Hara had nightmares about and the kind like in the movie The Others. This kind of fog. The day would have it that my morning would be packed with meeting-to-lunch-to-class, after a paper revision. But my morning took a more leisurely pace or perhaps a still, quiet pace. The pouring rain gave way to the mist and fog before I had to leave for my meeting. Miscommunication upon missed communication later, I find myself returning to my desk, through the fog, to have some more solitary time. Here I am. The fog surrounds the plateau, to me becoming an outward sign of the mystery that surrounds us. We study the history, the context, the methods, the meanings, and we are told throughout it all that we will never plumb the depths of God, the very Mystery we seek to explore. Often people say they are in a fog or feel foggy. When they say this, it is sometimes to express a sense of inability to comprehend or to find a way. The fog is literally a cloud that seems to dull the senses and/or obstruct our view. Walking to my car, I cast my eyes downward both to protect my glasses from the mist and to keep from straining my eyes in a way that made them hurt. Driving on the roads, the lights meagerly attempted to alert others of the car’s presence. I had to drive slowly, cautiously, because there are so many curves, and I do not yet know my way here. A powerful force in nature just by its presence, the fog renders me vulnerable. Maybe sometimes I just need to show up. Of course I do not know even a glimpse of what I need to know. Of course the way is revealed to me one step at a time. In a place where there are many learning to be servants and leaders in God’s name, this fog can be a none too frequent reminder of our humanity and our humility and our need for God’s grace.